Photo by: Mitchell Layton, Getty Images. Whether it's realistic or not, the St. Louis Cardinals shouldn't rule out a Harper acquisition. ST. LOUIS - We've all been there. Walking around the car lot when shopping for a new vehicle, spotting a hot sports car, and just gazing in its direction. Smitten beyond redemption, we register the thought of owning that car for a few minutes, and then come back to reality. Did the Cardinals do the same with Bryce Harper? Whether it's realistic or not, the St. Louis Cardinals shouldn't rule out a Harper acquisition. Two weeks ago, I wrote that the team had done enough this offseason to compete for the National League Central Division. Acquiring Harper would put them over the top, clearly ahead of the Milwaukee Brewers and Chicago Cubs. When it comes to a generational talent like Harper, you don't worry about where your roster stands. If he is still on the market and the idea was to be bold this winter, Bill DeWitt Jr. and John Mozeliak should make an offer. Check in. See what's happening before the Philadelphia Phillies swoop in like last-minute gift shoppers and sign him. Call it due diligence, practical movements, or whatever fits your comfort. I call it logic. Acquiring Paul Goldschmidt (for a year) and Andrew Miller for two years gives your team a new look, along with a burgeoning young rotation and lineup on the cusp. As I tweeted the minute "Goldy" was brought in, giving up on signing Harper would be a bad idea. If Philly offers stupid money and you decide it's not worth it, cool deal. But Mo and company should peek into the cupboard first. Here's the thing. We can soak up all the Dexter Fowler comeback stories like chocolate ice cream after a bad day at work, but it's not going to be as good as Harper in right field. Let's put on our fancy caps and look at Fangraphs projections. The site has the Cardinals winning 87 games, so they may have to muscle up after all. Steamer on Fangraphs projects Harper to have a 4.9 WAR, 148 OPS+ (100 is league average), and a .525 slugging percentage. That's just rude for opposing pitchers. Fowler is projected to have a 0.6 WAR and .389 slugging percentage with a 106 OPS+. 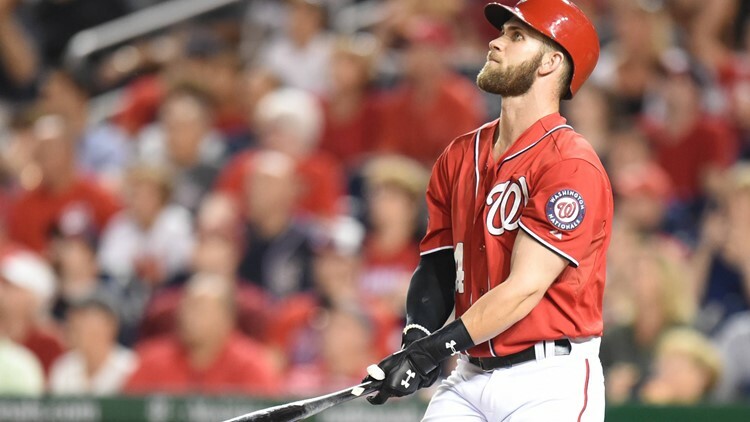 The defense isn't much of a difference due to neither being what one would call an above-average outfielder, although Harper would benefit from the majority of his playing time in right field as opposed to center. If the Brewers and Cubs are that close, and the Cardinals need something to push them ahead into open space, acquiring Harper would fill the void and appease a fanbase that has shown up, playoffs or not, for the past two decades. In one move, you'd rewrite your next 10 years, improve your on-field product, and produce not one, but two faces of the franchise. The Cardinals would also protect themselves against losing Goldschmidt to free agency later this season, because let's face, there is a possibility he could walk. At this point, the price has dropped considerably. The landscape of Major League Baseball is shifting, and it's not heading in the outrageous player contract region either. Harper isn't getting $400 million. It's not happening. Scott Boras can rename him Bryce Mike Trout Harper, and teams aren't handing over that kind of cash. The contract would have dropped by now. If it's ten years and $350 million, I jump at that and put him in right field 32-33 years old, and then move him to first base. It's not unrealistic to see Harper helping the Cardinals more than hurting them during the span of his time in St. Louis. He'd be a big upgrade. Here's the truth. The Cardinals probably aren't going to offer Harper a contract. All reports point to the fact that when Goldschmidt was acquired, the ducks started lining up for an extension there, and the Cardinals can only fit one love in their life. This is based off fact and history. When was the last time the Cardinals signed a player who hadn't previously played here to a monstrous contract in January? The answer should be never. Matt Holliday signed his extension before Jan. 10 back in 2010. Why write this article? The content and opinion holds firm. That's why. Harper is still needed on this team, because Marcell Ozuna is most likely heading out of town after 2019, and Tyler O'Neill is no sure thing while Fowler isn't a safe bet to return to 3-4 WAR graces. Harper is a better bet than all of them, so here I am. The Cardinals could win 95 games with their current roster, if all things go according to plan. They may edge closer to 100 if things go really well. Or, they could struggle to get 90 again, as respected projections have them below that mark. Harper changes that, so make an offer. Go big, be bold, and see where the chips fall. Instead, the Cards may be counting their unspent chips when Harper goes to the town of brotherly love. If it's only money, the Cardinals should sign Bryce Harper today. He should hold up well over the next 6-10 years. He's a good athlete, is only entering his true prime, and could flourish in a big time baseball town. Projections have him staying productive into his 30's. The Cardinals made an intent to be different this winter, and to a certain degree, they have. Stopping now may be futile in the long run.